Creative Foundation is pleased to announce the dates of Folkestone Triennial 2017, which will return for its fourth edition and will be held over a nine week period from 2 September – 5 November 2017. Curated for the second time by Lewis Biggs, the Triennial in 2017 will take the title double edge. The concept of double edge will further develop the inquiry into ‘sense of place’ that guided Folkestone Triennial exhibition, Lookout, in 2014. double edge refers to the two main axes around which Folkestone’s development as a town has taken place historically and geographically: the seashore and the Pent Stream, an ancient watercourse flowing from the Northern Downs into the sea, the present edge between East and West Folkestone. The title draws on the extensive academic study of ‘edge’ concepts in recent years: borders; thresholds; margins; the periphery; the liminal. double edge resonates with major contemporary cultural, economic and political realities experienced as part of everyday lives in Folkestone and across the globe: migration; border control; wealth inequality; sustainability; a challenging urban environment; and climate change, to name a few. Internationally recognised artists will be commissioned to make new contemporary artworks exhibited in public spaces around the town. 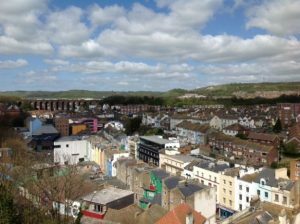 Artists will be invited to engage with Folkestone’s various narratives and material memories drawn from the town’s social, cultural, political and economic history. Some artworks will become permanent additions expanding the town’s permanent collection, Folkestone Artworks, built up since the first edition of the Triennial in 2008. 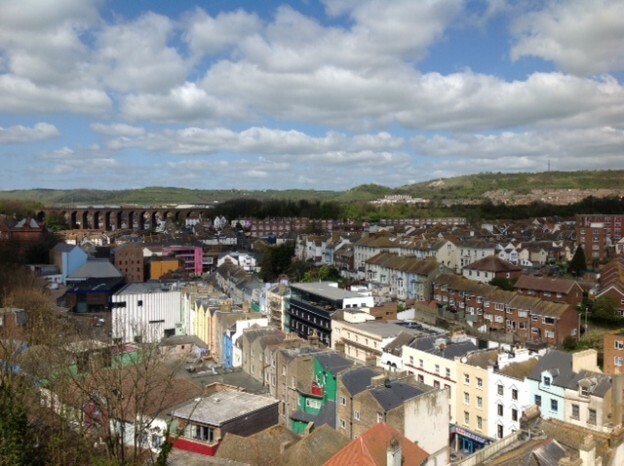 All artworks that make up Folkestone Triennial are commissioned with the ambition of positively affecting the urban ecology of the town as a place to live, work, visit and study. Lewis Biggs said: “The title double edge has two meanings – the first is one of anxiety: the edge of the world, the edge of the future and the unknown. The secondary meaning is one of balance, released through the artist’s imagination when one tips over the edge and looks back on the known with a renewed perspective. Great art makes change and the ambition of this exhibition is to give artists the opportunity to make excellent new work that plays with ambiguity and the several meanings of edge, stimulating audiences to consider why the world is the way it is, how it might be, and how it is always possible to change it. The commissioned artists for 2017 are: Rigo 23, Sol Calero, Michael Craig-Martin, Antony Gormley, Carmody Groarke, Alex Hartley, Lubaina Himid, Ann Veronica Janssens, Emily Peasgood, Amalia Pica, Marc Schmitz and Dolgor Ser-Od, David Shrigley, Bob and Roberta Smith, Sinta Tantra, Nomeda and Gediminas Urbonas, HoyCheong Wong, Gary Woodley, Bill Woodrow, Richard Woods, and Jonathan Wright.